Well done to Rang 4 who took part in the Primary Science Fair in the RDS last week. Their investigation explored what material makes the best bridge? Their investigations were based on designing the most effective and suitable bridge to link RMDS to Linear Park. It was a great experience for the children and thank you to all involved for your hard work! RMDS Cinema Night will take place 2nd February @ 7pm in the school! 4 classrooms (for JI to R4) and the Seomra Spraoi (for R5 & R6) will be turned into mini movie theatres! There are 5 fantastic movies selected, and tickets will go on sale on the gate from Monday, 28th January. Please note that there are limited tickets for each movie, and tickets sell out very quickly! The ticket price of €5 will include a snack bag for the children to enjoy during the movie! Despicable Me 3 will be on show in classes JI, SI, R5 and R6. Thor Ragnorak will be showing in the Seomra Spraoi for R5 & R6 only. Please note that all children must have a parent/guardian on site throughout the event. Parents are not required to purchase a movie ticket - but they do need to purchase an adult refreshment ticket! Parents and guardians are free to enjoy refreshments in the Hall while the movies are on - usually a very social night! We will require parents to monitor rooms for short periods of time, so please volunteer your 20 minutes at the gate when buying tickets, or when you arrive on the night. We also ask that you arrive at 7pm, and not much before! The Board of Management wishes to thank all those who support or intend to support RMDS through your voluntary contributions. The voluntary contributions in addition to the other fundraising activities greatly enhance the school environment for the children. Last year we raised €37,620 from voluntary contributions which was down on previous years. Although this was below our target of €45,000 we decided to run a deficit on our overall income and expenditure to continue the school refurbishment programme that commenced in 2016. Last summer this enabled us to complete further refurbishment work. 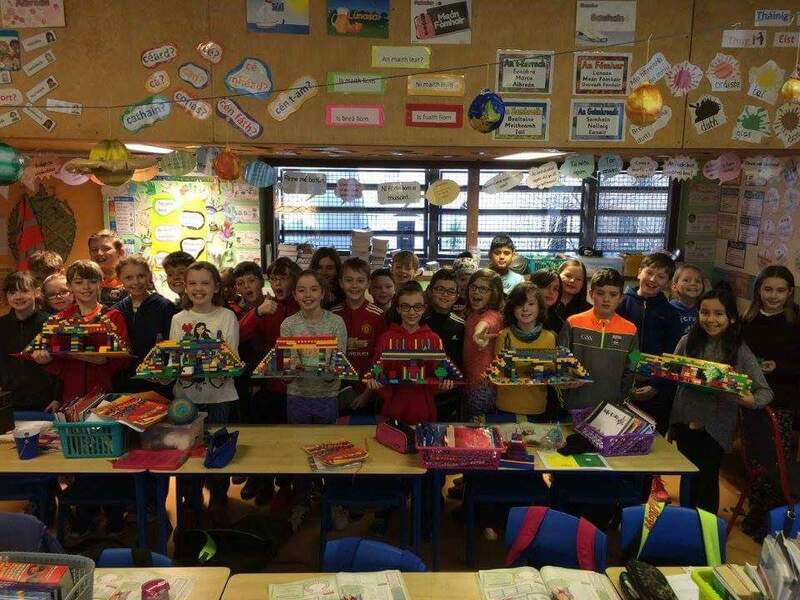 The four senior classrooms from Rang 3 - Rang 6 had floors and furniture replaced – a huge undertaking costing almost €30,000 alone but now all eight mainstream classrooms in the school are refurbished to a very high standard. Painting was done throughout the school, railings repaired and replaced both inside and out adhering to the original architectural design of the building and other vital maintenance work carried out also. The floor in the GP room was sanded revealing what looks like a brand new floor. Power washing of the yard and roof terrace brightened up the play areas. We are again setting a Voluntary Contribution target of €45,000 for this academic year and we are hoping for your support. Unfortunately, last year the Department of Education reduced our number of Special Need Assistant posts from 3 to 2. We also lost one of our full-time Special Education Needs teachers which means we are now required to share with 2 other schools. On this premise, the BOM took the decision to utilise our funds to hire a full-time classroom assistant in order to prioritise the learning needs within the school. We are fortunate to be in a position to do this but it can only be sustained through your Voluntary Contributions. Voluntary Contributions also fund additional curricular items such as swimming for Rang 2 and Forest Schools for Senior Infants, Rang 2 and Rang 3 amongst other activities. We very much appreciate all support and it’s important to state that contributions are voluntary. If you decide to make a voluntary contribution, please bear in mind that the school receives tax refunds for individual contributions in excess of €250. If you haven’t previously completed the CHY3 tax form please do so. Completed forms should be returned to the school as soon as possible. To make a contribution you can either make a once-off contribution by cheque and drop into the school office or you can make monthly or one-off payments online at http://www.rmds.ie/about/voluntary-contributions/. All voluntary contributions are treated with sensitivity and are completely confidential. Next week, Will Connor (Chairperson of BOM) and David Harney (BOM) will be available at the gate in the mornings if you have any queries or questions about voluntary contributions within our school. They will also have CHY3 forms available to you.